We are counted among the leading manufacturer, supplier and exporter of Decorative Marble Clock which is finely designed by our craftsmen. 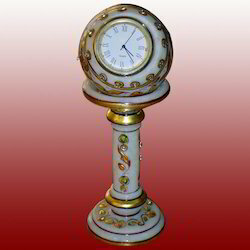 The unavoidable range of Marble Clock is appreciated by our customers for its quality marble. Superb luster, striking design and gentle touch are enriching the beauty of the product. The product can work on pencil cell and can be given as a gift. 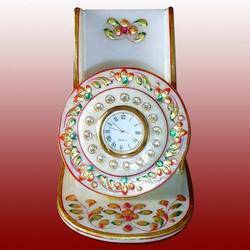 We are involved in manufacturing wide array of Decorative Marble Clock in the market. Our Clock are available in different shapes and sizes and add beauty to the interiors. Our products are quality tested on well defined parameters that ensures its durability and reliability. We also offer customization facility to our discerning clients. These products is available in pocket friendly rates. We bring forth for our client’s high quality Decorative Marble Clock. Craftsmen have fabricated the watches by providing it elegant design, perfect finish and beautiful pattern. Also, our provided marble clock is accessible in different designs & sizes to suit various customers’ requirements. Capable of enhancing the look of any interiors, these clocks are regarded for their unique design, fine finish and elegant look. Backed by a team of experienced professionals, we are manufacturing, exporting and supplying an extensive array of Decorative Marble Clock. Our offered marble clocks are precisely crafted utilizing quality assured marble and best tools according to the market trends. 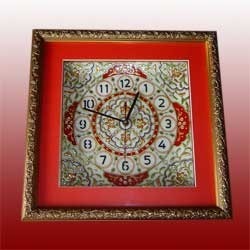 We provide these marble clocks in different customized form in terms of patterns, sizes and colors. Offered marble clocks are recognized for perfect sheen, smooth touch and tempting designs. Our company is the noteworthy names engaged in manufacturing, exporting and supplying an outstanding range of Decorative Marble Clock. The offered marble clocks are creatively developed under the guidance of our accomplished professionals using optimum quality marble. These marble clocks are widely used to decor the place and available in the market in varied patterns and styles that provide classy and trendy look. 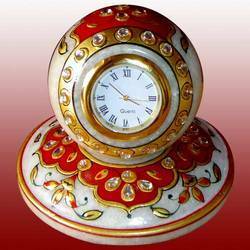 Our prestigious clients can avail these marble clocks from us at affordable price in quality packing. 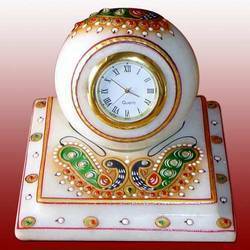 We are an eminent name engaged in manufacturing, exporting and supplying a superior range of Decorative Marble Clock. These are of good quality and the whole clock frame and dial is of quality marble that has been especially handcrafted by our skilled craftsmen. We offer customization as per the specifications detailed by our clients to fulfill their needs and requirements. Besides this, our marble clocks are completely checked from in order to ensure its flawlessness. Looking for Marble Clock ?